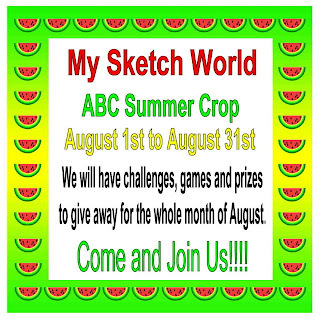 MY DOODLEY DO DAYS: COME PLAY - ABC SUMMER CROP! My gal pal Lucy Chesna owns this awesome blog called My Sketch World. She has turned that awesome blog into an awesome Community called My Sketch World. Lucy and her DT are hosting a fun filled ABC SUMMER CROP! Come on out and join us for some fun challenges and some games, and some good times! I have known Lucy for a few years now, and she has never let me down!